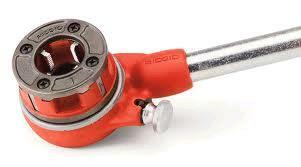 PIPE THREADER RATCHET W 1 DIE - 1/2"-2"
Wheeler-Rex Drop Heads and Dies are ideal for in-place threading from 1/2" - 2". Handle weight approx. 8 lbs. PIPE THREADER - EXTRA DIE - 1/2"-2"
* Please call us for any questions on our pipe threader ratchet w 1 die 1/2 inch 2 inch rentals in Kokomo IN, Logansport, and Central Indiana.